I needed a door stop, so this is what I came up with. 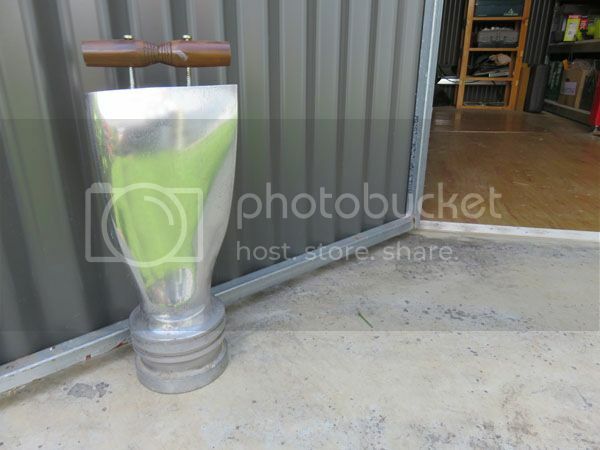 It's an old elastic side boot from the local Vinnies, filled with concrete and fitted with a manila rope loop handle. You don't happen to have ties with the Griffith Mafia, by any chance? All very clever Pete. Nice work. On the subject of home-made doorstops, this one came from a Cessna 185 propeller that crashed in PNG (no, not me this time). It holds my shed door open, and the top handle makes for easy handle- ing. I had some spare time and some spare bits and pieces, so here's an adornment for my chook shed that I knocked up today. I'd say the matter is urgent if you've resorted to making labels for your out-buildings out of horse shoes to pass the time.